When I had my 'H' I found that the VX jack wouldn't fit onto its location (at the back) because, if I remember correctly, the body kit was fouling the jack. 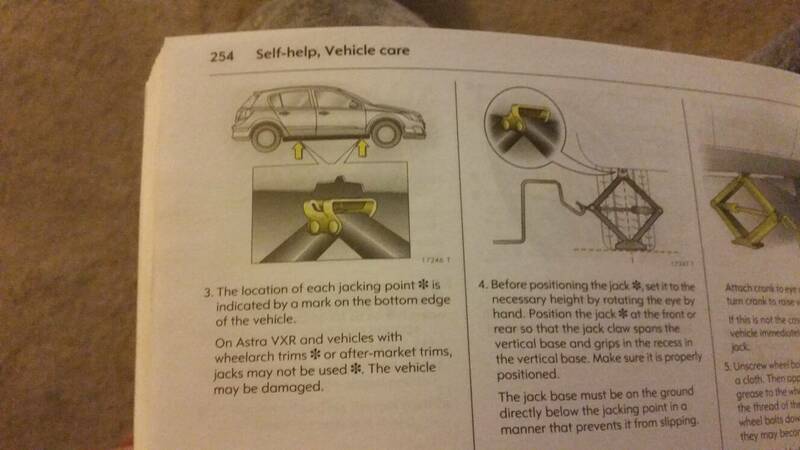 I bought a Halfords jack and managed to jack it from one of the arms. I have a 'J' now and it doesnt come with a jack. I bought one but again will jack it up from one of the arms. My 'H' was fitted with 19 inch rims and the original owner bought a fifth wheel as a spare - great. VX penny pinched on the 'J' - no spare, no jack, and you blow the tyre up with a repair foam and the garage wont fix it !! Pisses me off cars come without a spare wheel nowadays. Space savers were bad enough but half of them don’t even get that. The vxr wheels are too big and expensive for a spare to be financially viable. And a spacesaver would be too small to mingle with the other 3 big wheels. Does the Astra have the spare wheel well? And like the astra mate as the vxr corsa has extended skirts etc there was probably no jack included as it was viewed as "unsuitable". Your manual should tell you. The base chassis are all the same mate. the wheel well would obviously have housed the space saver on the smaller wheel models.